When your kids were young, they were probably content watching a movie, reading books, or playing games together. But fast forward a few years, and there's a good chance they would rather spend time with friends. Busy schedules can also make it more difficult to find family time as your kids grow up. So it's important to be proactive about making time to be together. Family fun nights are a great way to spend quality time together and provide your child with positive attention. Whether you’re able to schedule fun night once a week or once a month, regular family time can be an important ritual in your growing kid's life. The key is to make family fun night a priority and get everyone in the family involved. If your kids groan when you bring up spending quality time together, make it clear that everyone is going to participate. For one night, don’t answer the phone, ignore social media, and step away from your electronics. Make your time together about talking, laughing, and creating new memories. Look for activities that will give you an opportunity to get to know one another better so you can maintain a healthy relationship as everyone grows older. Here are five family fun night ideas that can get you started. There are lots of ways to turn a meal into family fun night. One way is to choose a menu as a family. Shop for the grocery items on the menu together and then prepare and cook the meal as a family. Get adventurous with your meal choices or choose cuisine from different parts of the world to really make it interesting. Another way to get everyone involved is to have each person be in charge of a certain course. One person can choose and prepare a salad, while other people take charge of an appetizer, main course, side dish or dessert. Then, eat together as a family. You might explore dishes from around the world to make it even more fun. Or, create a theme for your dinners. Doing something different from your usual meals will help your family create fun, lifelong memories together. Be open to suggestions from your child about how to make your family dinners more fun. Although it can be great to turn off your technology on family fun night, make an exception for movie night. Take turns choosing the movies and preparing the snacks. Get out some blankets and pillows and watch the movie together. Keep your phones away so it doesn't turn into a night filled with everyone staring at their screens while a movie plays in the background. Talk to your kids after the movie about what they liked or didn’t like about it. Start a conversation that will help you get a better understanding of their point of view. Youth are used to fast-paced video games. 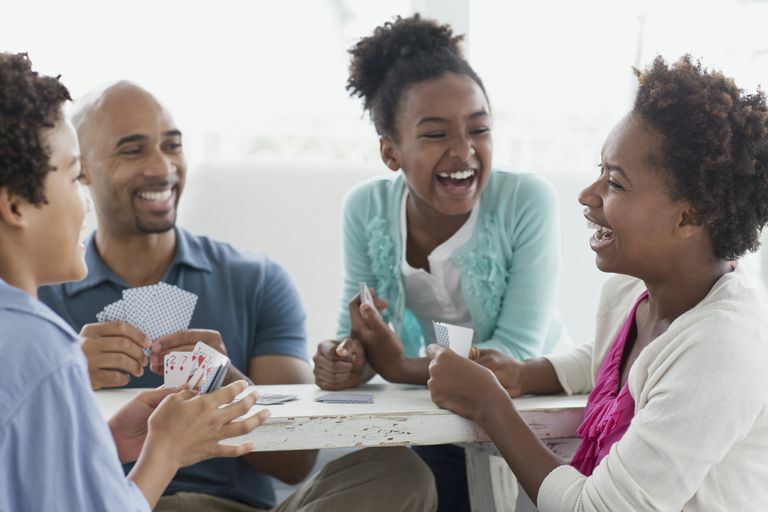 Slowing down to play board games can show them that they don’t need electronics to have fun. If your family hasn’t found one particular game that everyone likes, experiment with different games on board game night. Take turns picking out games or divide the family into teams. Just make sure your game nights are more about having fun rather than a serious competition. Doing something active together can be a good way to bond as a family. Play basketball, soccer, badminton, or simply kick a ball around the yard. You can even just go for a family stroll around the neighborhood or go for a walk in the woods. Getting active is a good way to get some exercise and it also can get some conversation flowing. Take turns picking what activity you’ll be doing on family fun night. Maybe one time you’ll choose to go for a family picnic and another night you'll go camping. Allowing each family member a turn at choosing the activity is a great way to get everyone involved and excited about family fun night. If you have big age differences between your children, it can be good to mix things up so you can find activities that will please everyone.